Drawing on the rich imagery of Hans Christian Anderson’s infamous tales, Red Shoes is a powerfully modern piece of visual storytelling. When two girls stray from their path, they become lost in an elaborate woodland full of secrets, where their only hope of escape is the strength they find in each other. 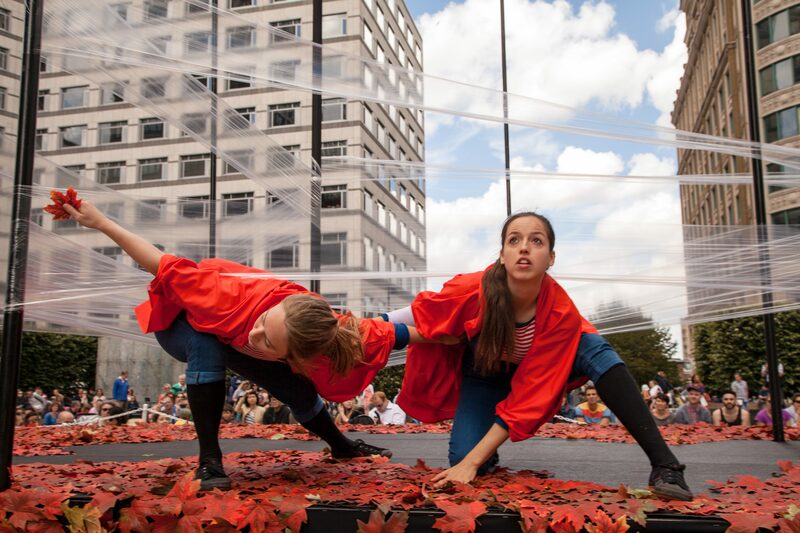 The talented duo perform gravity-defying feats on the Chinese pole, on a bespoke outdoor set that creates an island of colour and an intricate landscape for them to weave through. Red Shoes was originally developed with Rowena Deletant, a disabled artist who performed an early version of the work entitled From Here in 2010, the last performance of her career. Meditating on powerful themes of strength in the face of adversity, the show has evolved to rewrite Anderson’s dark story into a celebratory tale of hope and friendship.